Blessings Under the Bridge volunteers prepare to serve �blessed brown bags� in Spokane. Sometimes, it's the sound of my car's automatic door lock that shakes me out of my stupor. It's a red light. There's a ragged man just feet from my vehicle holding a cardboard sign. I've got daughters in the car, you know, and a wife. So I hit the switch. Fwap! The sound hangs in the air, and I avoid eye contact, embarrassed. I'm sure he heard it, too. How couldn't he have? And I worry: Did he feel that? Did the sound of me magnifying the distance between the two of us human beings communicate something I never intended? Is this an Americanized caste system I'm perpetuating, as if this man is an untouchable, or a threat, or somehow less than me? Green. I release the brake and ease away, but the internal wrestling match of competing values is along for the ride. They say you can't be too careful, but how would I feel if I was on the other side of the passenger door window? Maybe I shouldn't have locked the doors. Or maybe I should have spotted him sooner and locked the doors out of his hearing range. Or better, maybe I just need to remember to always lock the doors at off-ramps and intersections. Shoot, maybe I just need to get one of those cars that automatically locks once you get up to speed. It takes me far too long to snap to the next realization: To lock or not to lock, that's not the question. But why did I react the way I did? Did I really think I was in a threatening situation? Does this have anything to do with the fact I don't believe in cardboard signs, don't trust what happens to the handouts? Am I really the guy who shakes my head at others who give money blindly? (We're enabling them! We're propagating laziness!) Have I become callously rigid about that whole "we should teach him how to fish, but not give him the fish" mantra? Maybe that's it. But then I wonder how the fishing instructor keeps the pupil's attention. You know, if the student has other things on his mind. Like that he's freezing and starving. But that's not really the question either. It wasn't to lock or not to lock, and it's not to hand out or not to hand out. Nah, the real question is more personal: Are you in or are you out? Jessica Kovac is in. I admire that about her. Unlike me, she doesn't dwell on the questions. She seems to have already experienced the freedom of knowing that the solution to the problems of homelessness and hunger can't be worked out like a math equation or spelled out in an essay. The more I think about Jessica, the more I wonder if those of us crunching the numbers and rationalizing the formulas are just as guilty of perpetuating the problem. Sometimes we're the enablers - enabling ourselves an out. Sometimes we're the lazy ones - we don't want the inconvenience of rolling up our sleeves. It was in this fog of mental tug-of-war that I followed Jessica around downtown Spokane recently. She and a fleet of volunteers from Blessings Under the Bridge pass out "blessed brown bags" every Wednesday to homeless men and women. Join The Splash's "12 Dollars of Christmas" drive. For $12, donors can provide 10 brown bags each with deli meat and cheese, crackers, fresh bread, chips or crackers, a fruit cup, baked goods or sweets and a drink. And take the opportunity to share your own "blessings" in The Splash. For more information click here. Lakeside Church, 23424 E. Knox St. I'm such a skeptic - such a self-superior jerk, really - that I'm ashamed to admit what struck me most was how unconcerned Jessica seemed to be with sizing up the people she interacted with. Blessings Under the Bridge never gives out money, but still there was a refreshing absence in Jessica's interactions. No measuring stick evaluating the legitimacy of a need. No sign of strings attached. The meals and blankets and gloves and socks were distributed without literature inviting holistic life change, without an underlying expectation that this was step one in a recovery program. I found myself bothered by that. And thrilled by that. Then I watched as Jessica greeted person after person by name - laughed with them, connected with them, asked with concern about the friends she hadn't seen in a couple weeks. For some, it was clear these interactions were craved more than the food. After four years of weekly investment in the lives of Spokane's homeless, Jessica believes these are people not all that different from the clientele she once served at Hay J's, the fine diners whose tip money Jessica used to purchase food to fill those first brown bags four years ago. Jessica and her husband, Mike, like to point out that addiction, anger and hurt exist under fancy roofs and under overpasses, hidden behind both cubicle dividers and alley dumpsters. This resonated with an e-mail a friend sent me the day I shadowed Jessica: "Rich and poor have this in common: The Lord is the Maker of them all," it read, quoting Proverbs 22:2. We are humans in this together, and we need to respond to one another humanely. Perhaps compassion and a willing spirit go further than a detached philosophy of assistance by looking the other way. Chances are, you aren't Jessica Kovac. There aren't many like her. You may not be called to the front lines of the problem, passing out fish and greeting your homeless neighbors by name. But can you prepare the meal? Can you help fund it? Maybe you have a platform from which you can advocate for the need. Or maybe you are the fishing instructor. That person is needed, too, as are those who think through the solutions, so long as they aren't veiled attempts to make ourselves feel better about inaction. If we can get past this - and if we can get past the conceited illusion that the little role we are fortunate enough to play is somehow more important than the little roles that land in the sweet spots of others - then all that's left is that nagging question. 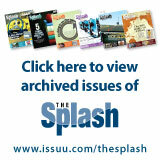 Josh Johnson is editor and publisher of The Splash. 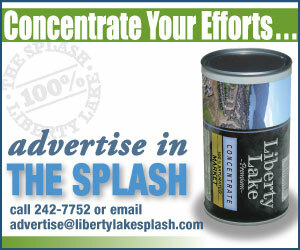 Write to him at josh@libertylakesplash.com.